Hi everyone! Last evening we investigated at a private residence. We had one of our best flashlight sessions ever. We asked and received answers to roughly 25 questions. This was very encouraging, now we must go thru all the rest of our evidence to see what else we might have captured. Was a great night and we look forward to whatever else we may find. Thanks for being patient we will have more updates soon! We’ve all experienced that feeling before, while walking into a foreign building for the first time; the feeling that someone is watching us, lurking in the dark, about to jump out or sneak up behind us. I experienced that feeling today. Some days, my job blesses me with the opportunity to visit some pretty amazing buildings. Today, I toured a grand, 4,000 square foot, prominent 1886 house, located in Manitowoc. My feet glided effortlessly from room to room as I spun in circles to admire the home’s original character. Part of me wanted to “ooh” and “aww” at each and every detail of whichever room I was in, while the other part of me couldn’t wait to keep moving onto the next room to see what else this glorious house had to offer. I placed my hand on the worn, curved wooden railing that guided me up to the second floor. I entered the grand ballroom, which had been converted into the largest bedroom I’ve ever seen. The wood burning fireplace was soiled with ashes and soot from the past 150 years. The entire home was painted in light, airy hues of sky blues, morning dew and daisy yellows- very welcoming and clean pastels added to the home’s exuding comfort and feeling of freedom. Since fall of last year, MPIN has taken a bit of a hiatus from the spirit world, at least in regards to actual location investigations. The reasons for this are many, and include changes in our professional lives, babies being born, a wedding, more babies on the way, etc. Basically, life took priority, which it will always. However, MPIN has never really stepped away from the Paranormal world. Our research into past investigations continues, as does research into future investigations for this upcoming year. Equipment upgrades, improved investigative tactics, continuing education of current industry trends, etc have all been par for the course for the corps members of MPIN during this brief intermission. We are looking forward to a number of exciting investigations throughout this spring and summer, including a project we will be announcing in the near future; an exciting, though quite complex investigative undertaking into an important part of American History that we are confident no other paranormal team has taken upon before. Presentation at the Menasha Public Library. 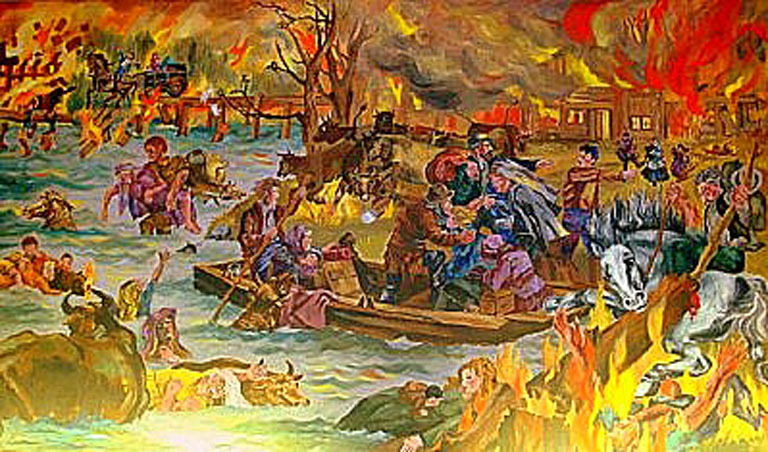 142 years ago today, October 8th, 1871, a fire that killed more people than any other fire in the history of the United States ravaged NE Wisconsin. It is still today, 142 years later, the worst natural disaster in our nation’s history. The MPI Network conducted a paranormal investigation in Peshtigo this past September, just days prior to the 142 year anniversary. Our goal was to examine the possibilities if the energies from that day still exist, if spirits from those effected by that tragedy are still searching for answers, and to let them know that they, even if our history books tell them so, have definitely not been forgotten. We are still in the review stage of this investigation, though we are already aware from completed material, that all three phases of our investigation goal had positive results. Evidence page for this remarkable, though humbling and solemn investigation, will be coming soon…. I decided to quick run in to grab a roll of painter’s tape. Unfortunately, “quick run-ins” historically end up in me getting sidetracked by something that catches my eye and time goes out the window… as did this evening. Within a minute after entering the store, I knew I would be there for a while. There was another woman eyeing over paint cans and brushes, seeming somewhat lost and almost in a daze, probably trying to imagine random rooms in her home painted in different colors, possibly decorated with different furniture and new curtains… When abruptly, another woman approached her side. The second woman was an older woman, probably in her early 70’s and put her hand on the first woman’s shoulder as she approached and stated, “I’m really sorry. I can tell you’re in mourning right now.” The first woman paused, stunned by the comment and began looking around as if she thought that maybe she was being mistaken for someone else. The second woman then introduced herself as a medium. The medium then asked, “Did your husband pass away recently?” The woman replied, “Yes, about three months ago.” Being an avid fan of the Long Island Medium, Theresa Caputo, I was drawn to linger nearby, but was also aware of the sensitive nature of the conversation and decided it best to distance myself. About fifteen minutes later (or 20ish), still needing my painter’s tape, I gradually made my way back to the front of the store, where the medium was saying a prayer out loud to help the woman’s husband’s spirit move on and to help calm the woman’s sadness. The woman stated that she had been struggling with depression and that she is finally at the point where she is able to go out to stores and begin to interact with the community again. As the women departed, going in different directions, the first woman passed me. Her face lit up and appeared bright. She made eye contact with me and smiled. She appeared confident and didn’t have that same dazed and confused look as she did earlier. The weight had been lifted. I’ve always been a hopeful skeptic. I hope that there are individuals in this world who possess these special abilities and natural talents, but at the same time skeptical of who is truly gifted. Unfortunately, everyone wants to be special and everyone would like to feel as if they had been hand chosen to carry out a special plan, maybe making them somewhat spiritually superior to those around. To those out there who hope they’ve been selected- proceed with caution in your practice. You’re working with people’s emotions and the sensitivity of the topics and claims you make may be more detrimental than good. Fortunately my experience today was truly a positive intervention and for the sake of the woman involved, thank you to the medium who selflessly offered this consultation. Anyone else have any interesting experiences or thoughts? The Midwestern Paranormal Investigative Network would like to invite you to a free presentation on Tuesday, October 22nd at 6:30pm at the Menasha Public Library. The presentation will highlight the local haunts that our group has investigated throughout the Fox Valley. We will also talk briefly about our experiences and findings from famously haunted locations in various other states throughout the country. Along with sharing some of our best evidence gathered, we plan to go through ghost hunting basics, learning paranormal lingo, discerning questionable evidence and common equipment used in the field of paranormal science. This can be as formal or informal as you wish! Please come ready to share your own personal experiences, get some questions answered and even learn how to conduct your own paranormal investigation! Ghosts and baseball… what could be better? Here’s an entertaining article about Milwaukee’s paranormal. I’m not big on psychics generally. Some are obviously more credible than others, but Sylvia Brown’s time, I think, is coming to an end…. MPI Network is excited to announce that we will be giving a free presentation at the Menasha Library on October 22nd. At this event, we will be presenting some of our best evidence we have obtained over the last few years of investigating various sites throughout the valley, talking about techniques and equipment, and answering questions from the audience. We look forward to this interaction and will remind you all again as the time grows nearer.